After playing through a number of platform levels, each of which accompanied by music from the film, you get placed on a flying carpet for a section entitled "rug ride". It's an automatic scrolling level, which speeds up over time to the point where you are almost required to memorise the level - but not quite. The music that plays is an original composition for the game, and fits perfectly with the acceleration. You get to the end, and realise that for the last ten seconds of the level you've been holding your breath ... but you survived, and you are five lives up. Not the big oozium level, which is the part of the campaign I can remember, but Twin Isle, one of the war room maps. Twin Isle was in Advance Wars 2, but it never seemed a stumbling block there. In AWDS, however, something about the balance had changed and I played that one map for weeks just trying to get an A grade. I managed it, after working out a wonderfully elegant solution, which this margin is too narrow to contain. You get towards the end of the game and suddenly you're in Venice. And it really is Venice - I've been a couple of times and I recognised it immediately. There have been few occasions when I've felt such a sense of location. As part of my drive to get the most out of Nintendo WiFi Connection before it gets turned off, I've downloaded all the extra puzzles for the Layton games, loaded up games with online leaderboards such as Geometry Wars Galaxies, and played a last few games of Mario Kart DS and Tetris DS. Deep in the DS pile was WarioWare DIY, which I'd never even unwrapped. I've no idea why, since I loved all previous games in the series, and the idea of programming your own games seems inspired. So I started it yesterday, playing through Mona's games, going through the initial game building tutorial, and then wondering how I could unlock all the other characters. I built my own game (Smash TV, so called because in it you must smash a TV), followed the other tutorial, and still nothing. This morning I found that you have to wait until the next day for the next character to unlock. Obviously. This wasn't a huge problem, though, since I went online last night and downloaded loads of extra games. Some were built by professional games programmers, others came from the "weekly games" which I understand were generated by users. I had to download one game at a time, which was dull, but it meant that I could then play loads of games last night with varied levels. None were as good as Smash TV though. It was the good ending - I had managed to fulfil all the requirements through the story (more by luck than judgement, I fear), so I found out about the experiments of the past, the identity of Zero, the way that bracelets worked, and the truth behind the multiple doors marked with a 9. If you're going to play this yourself, don't read any further. There were many questions left unanswered. Of course, the whole game ends on a cliffhanger note - where are June and Santa, what was Lotus doing by the side of the road, will the timeline heal itself to allow Akane to live? Was Akane there the whole time through the story, or was she just imagined? When she felt faint, was that because Junpei was facing puzzles that might have led to him being unable to get to the incinerator? Some of the mathematics towards the end of the true ending were a bit of a stretch, as well. Suddenly moving to base-27 and then converting that to a digital root was very odd. Revealing that June's bracelet was number nine means that there were two number nine bracelets and no number six - but a convenient O which is six as a digital root. It felt that after playing the game according to the rules, everything was being broken at the end. Still, an intriguing game, which shows how videogames can present a story in a way that film or books cannot. Last Window: The Secret of Cape West (DS): COMPLETED! Obviously, I’m going to have to stick some spoilers in here, otherwise I’m not going to be able to say anything about the game. Because, oh boy, were there a few reveals in the latter half of Last Window. Like in the first game, hardly anyone was quite who they appeared to be, and everyone had at least one secret to hide. The main “what? !” moment was when Dylan – as in, bumbling clumsy sticky-beak handyman Dylan – is revealed to not just be “a bit curious” or even “somewhat creepy”, but in fact is spying on behalf of Nile – the mysterious crime organisation that operates outside the law (and, as it happens, within the law itself). Sure, I thought there was something a bit odd with him, but he’s essentially the main bad guy! Then there’s the full backstory of Mags and her involvement in the past events, leading to her almost killing Kyle and Tony (seriously – old woman got mad ninja knockout skillz) when Kyle’s just about to make the final breakthrough. Where the hell did she get “police-strength sleep spray” from? It’s never explained. And Will White not being Will White? And Marie nearly jumping off the roof to her death? Drama! Anyway, as in Hotel Dusk, the last few hours play is mostly about tying up the ends of each character’s story. Most of them have a past issue that needs resolving, or they need convincing to leave Cape West, and once that’s done Kyle moves onto the getting the final answers to all the remaining questions. In this game, that meant finding a hidden poker room, which revealed in a very Raiders of the Lost Ark way, a secret stash containing the very gem Kyle’s dad died stealing 25 years ago. As with Last Window, there’s a lot of million-to-one chance coincidences. Some are explained, some are left as mere unlikely chances. This does make the story feel a little contrived, but thankfully – again, like the first title – the story is strong enough to carry it. It felt like a proper detective novel, played out with a stylus. There weren’t many puzzles, and most were quite easy, but it made (as did Cing’s other works) great, and unusual, use of the DS too. In one part of the game you have to retrieve a key from a musical box. It’s inside a rotating drum in the box, and the DS itself acts as the box and lid. Open the DS, the music plays and the drum rotates. Close the DS and the music stops. To get the key out, you have to mostly close the DS when a gap in the drum lines up with the key, then press R to lever the key out a little, then squeeze the stylus inside the mostly-shut DS to “grab” the key and pull it free. Awkward, just like the actual task would be really. Brilliant! At a little over 15 hours I’d finished the game. I’d say that was a pretty much perfect length to spread the story out without wishing for it to just wrap up quickly. My only complaint is that there aren’t any more Cing games to play, as they disbanded years ago. Shame. I've reached the end of the story, but I've not reached the end of the game. Let's rewind a bit. 999 (with a full subtitle of 9 Hours, 9 Persons, 9 Doors) is an adventure game, with the core gameplay being based around exploration and puzzle solving to escape rooms. 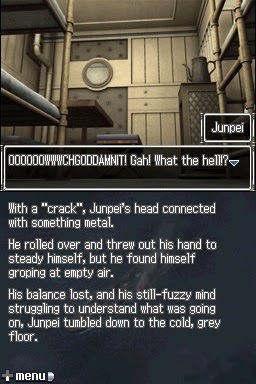 However, there's not a huge amount of exploration available to the player - instead, the main character (Junpei) explores the ship along with his new-found acquaintances, and the player is informed of this through reams of text. At times, this is almost like a non-interactive version of an interactive novel ... a novel, then. What surprised me was how well the text is written. It could pass for a professional story, with appropriate descriptive language and varied vocabulary. There are a few occasions where the wording felt slightly off, but each character had their own voice and mannerisms, which led to an accomplished narration. It's sad that this should be a surprise, but there are precious few games with as much attention paid to their script. So, having reached the end of the story, I've completed the game, surely? No. One of the limited interactive elements of the game is the choice of which doors to go through at three key points in the game. I ended the last game with Junpei being stabbed in the back, and have since restarted. Annoyingly, while I can skip through the text, I still need to solve the puzzles again in areas that I've been through before. But each playthrough should give more information about the characters, and I understand there are six potential endings. I'm not sure I'll collect them all, but the game is significantly quicker to play the second time around, so I'll see what else I find. Super Backlog Fighter! I’ve had this for almost a year now, but, like many things, it’s sat on the Pile of Shame (TM). But now I have saved it from that pile, and am playing it! On an actual DS Lite too, for added retro authenticity. Not that the game, or the DS Lite is actually that old, but you know what I mean. Many moons ago, I played Hotel Dusk: Room 101. It was a point-and-click interactive story adventure puzzle detective novel noir game. This is also a point-and-click interactive story adventure puzzle detective novel noir game. Not surprisingly as it’s the sequel. Now, I recall many of the events in the first game, and the basic plot and so on, but everything else has long since fallen out of my head. Through playing Last Window, some has returned, but I feel I really should re-read the novel that came with the original to refamiliarise myself with what went down. Last Window is plainly a continuation of the original game in more than just plot. The controls and graphical styles are the same, the sort of dialogue and puzzles wouldn’t be out of place in Hotel Dusk, and you’re even (essentially) in another hotel – only this time in Room 202 rather than 101. If only developers Cing were still around so we could find out what mystery surrounds Room 303. Sadly, 404 is not found. Oho. Like the first game, there are some boggling coincidences in the characters and locations, almost as if the Hotel Cape West is the receiving area for some sort of alien kidnapping where people who have linked pasts (not all knowingly) are plucked out of their lives and made to stay in the hotel until they figure out what they all have in common. And not just links to each other, but also links to the events of 13 years before the game takes place (which is 1980), and a further 12 years before that. And murder. Or possibly murders. Currently, I’ve played up to part way through Chapter 5. I’ve gained access to the out-of-bounds (probably due to said murder) fourth floor of the Cape West, found more questions than answers, and poor lonely Kyle Hyde (the protagonist) has completely failed to score with, or, in fact, even notice the rampant flirting of the resident Filthy Minxes (TM) Claire and Betty. He’s too busy being down about the death of his dad, being evicted from his apartment, and losing his job. Poor guy.